University of California, Berkeley, CA, U.S.A. The main characters of Nintendo’s 2015 video game Splatoon and its 2017 sequel Splatoon 2 are Inklings, a species of sapient cephalopod with the ability to transform between a humanoid form and a more traditional coleoid form. Also present are the Octarians: octopus descendants that take the role of enemies. Since the release of the Octo Expansion for Splatoon 2, the Octoling, a subspecies of Octarian with similar appearance and abilities to Inklings, has become playable. Both Inklings and Octolings are hyper-evolved descendants of modern cephalopods, having evolved after sea level rise drives humanity to extinction 12,000 years in the future. Exactly which cephalopods Inklings and Octolings descended from is unknown. In-game lore posits that Inklings are descended from squids and Octolings are descended from octopuses. A previous article covering the cephalopods of Splatoon has suggested links to Ommastrephidae or Thysanoteuthidae for Inklings (Salvador & Cunha, 2016). Here, I set out to resolve the relationships of these cephalopods with phylogenetic analysis. Usually, scientists would use molecular data, i.e., DNA or protein sequences, to determine relationships among recent taxa. There have been numerous recent studies on the relationships of coleoid cephalopods based on molecular data (e.g., Sanchez et al., 2018). However, since video game characters have no DNA, this cannot be applied here. Thus, only morphological and behavioral data can be used. Luckily, there have been morphological phylogenies of cephalopods in the past to build off of. To answer this question that nobody was really asking, I constructed a morphological dataset of cephalopods. This combines four previously-published morphological datasets (Young & Vechione, 1996; Voight, 1997; Lindgren et al., 2004; Sutton et al., 2016), as well as additional characters. 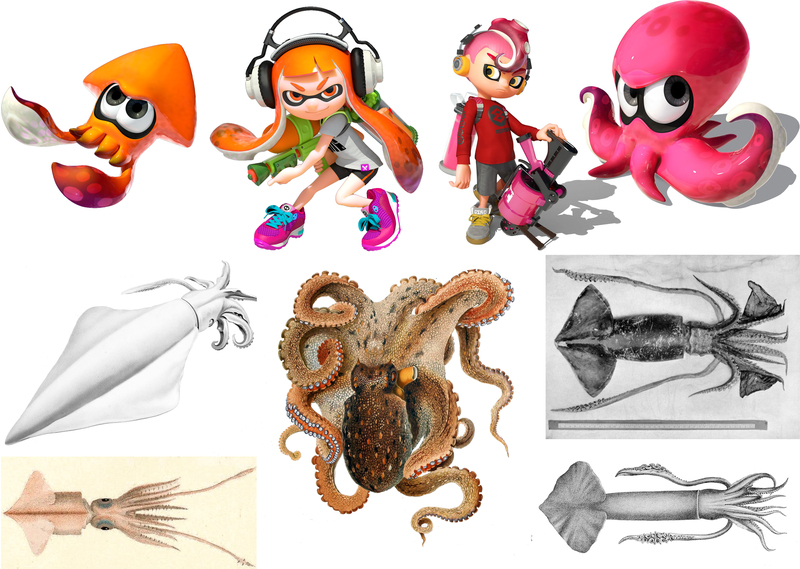 I also added Inklings, Octolings, and nine extant squid genera to the dataset (Table 1): Dosidicus, Eucleoteuthis, Hyaloteuthis, Lampdioteuthis, Lycoteuthis, Mesonychoteuthis, Todarodes, Todaropsis, and Watasenia. “Palaeoctopus pelagicus” was removed because it isn’t a cephalopod at all, but fragments of a fossil coelacanth (Schultze et al., 2010). Table 1: List of OTUs and sources of data. Extinct taxa are denoted by the symbol (†) before the species name. New data is marked in bold. Note that inklings and octolings are fictional taxa. A few species in the same genera were lumped due to either having identical codings or in the name of having more complete Operational Taxonomic Units, or OTUs (several were coded in one dataset and not the others). Most Octarians have highly unorthodox morphology compared to Inklings or Octolings, and were excluded because how do you code a tentacle with a face? The resulting dataset has 283 characters and 139 OTUs. I ran analyses in TNT (Goboloff & Catalano, 2016) using equal weighting methodology for 2000 replicates, producing 10 trees each. I ran one analysis with no constraints and one with a “molecular backbone” – forcing the analysis to fit a certain topology corresponding to what molecular phylogenies tell us. The framework of Sanchez et al. (2018) was used for the backbone analysis. This way, the trees can be built around how certain taxa are related, while the morphological data plots where those without molecular data would be. The outgroup taxon was Nautilus pompilius. Surprisingly, contra in-game lore, Inklings and Octolings are consistently recovered as sister taxa. The two species are united by numerous features, mostly having to do with living on land and shooting ink everywhere. Feasibly, these could have evolved independently, but compared to other NPC species in the game, the similarities between these two are striking. If this is true, this may make their rivalry analogous to that which may have occurred between Neanderthals and anatomically modern humans in the Pleistocene (Finlayson & Carrión, 2007) in response to environmental change (changing sea levels and climate change, respectively). This may also explain why most Octarians are so different from Octolings – they may have actually descended from octopuses, and gone down a completely different evolutionary path towards sapience and land-living. It is canon that Octolings were brainwashed into serving the Octarian army, so this might imply that the Octarian-Octoling link is largely fabricated. Of course, that adds a layer of in-game cultural implications that is out of the scope of this paper. In all analyses, both species ended up well inside Ommastrephidae, the flying squids. This fits with what we know of Inkling biology. As previously noted by Salvador & Cunha (2016), the leaping ability of Inklings in squid form (“super jump”), demonstrated in Splatoon, Splatoon 2, and Super Smash Bros. Ultimate, may be exapted from the tendency of flying squids to jump above the surface of water. Inklings are also bioluminescent, a trait shared with certain members of Ommastrephidae, including Ommastrephes itself. The unusual octopus-like form of the Octoling may be convergent evolution with Octopoda; Octolings display the same “super jump”, not known in any octopods, and similar awkward terrestrial locomotion in coleoid form (in contrast to the Octarians). But aside from being a fun and way too time-consuming exercise in phylogenetics, what does this tell us? Our results echo the suggestions of Salvador & Cunha (2016) that the design of Inklings was likely heavily influenced by ommastrephid squids that live in Japanese waters, such as Todarodes pacificus and Ommastrephes bartramii. This shows that the designers of the Splatoon franchise likely deliberately modeled this game’s characters after specific cephalopod species (echoed in the fact that the Japanese names of several characters reference specific real-world species). Nintendo certainly knows their squids. Figure 2. Strict consensus tree of the “spineless” analysis, with Pohlsepia removed a posteriori because it was unstable. Figure 3. Strict consensus tree of the analysis with a molecular backbone constraint applied. Finlayson, C. & Carrión, J.S. (2007) Rapid ecological turnover and its impact on Neanderthal and other human populations. Trends in Ecology & Evolution 22(4): 213–222. Goloboff, P.A. & Catalano, S.A. (2016) TNT version 1.5, including a full implementation of phylogenetic morphometrics. Cladistics 32(3): 221–238. Lindgren, A.R. ; Giribet, G.; Nishiguchi, M.K. (2004) A combined approach to the phylogeny of Cephalopoda (Mollusca). Cladistics 20(5): 454–486. Salvador, R.B. & Cunha, C.M. (2016) Squids, octopuses, and lots of ink. Journal of Geek Studies 3(1): 12–26. Sanchez, G.; Setiamarga, D.H.E. ; Tuanapaya, S.; Tongtherm, K.; Winkelmann, I.E. ; Schmidbaur, H.; Umino, T.; Albertin, C.; Allcock, L.; Perales-Raya, C.; Gleadall, I.; Strugnell, J.M. ; Simakov, O.; Nabhitabhata, J. (2018) Genus-level phylogeny of cephalopods using molecular markers: current status and problematic areas. PeerJ 6: e4331. Schultze, H.P. ; Fuchs, D.; Giersch, S.; Ifrim, C.; Stinnesbeck, W. (2010) Palaeoctopus pelagicus from the Turonian of Mexico reinterpreted as a coelacanth (Sarcopterygian) gular plate. Palaeontology 53(3): 689–694. Sutton, M.; Preales-Raya, C.; Gilbert, I. 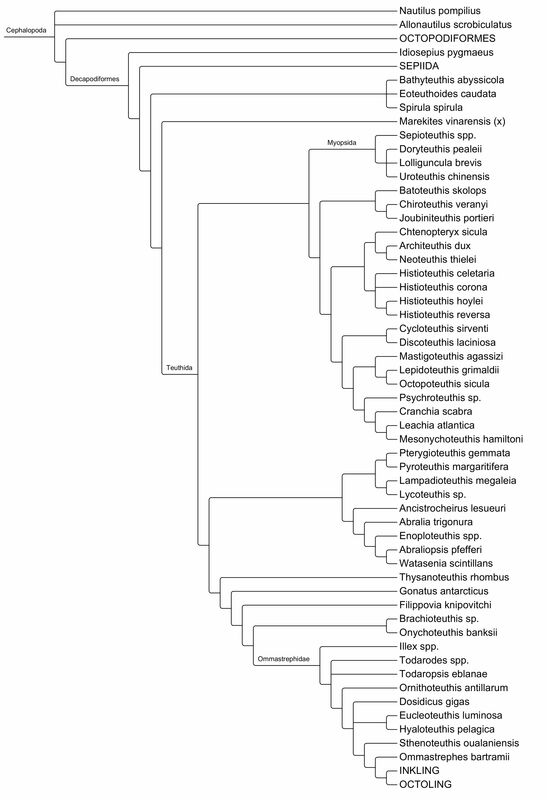 (2015) A phylogeny of fossil and living neocoleoid cephalopods. Cladistics 32(3): 297–307. Voight, J.R. (1997) Cladistic analysis of the octopods based on anatomical characters. Journal of Molluscan Studies 63(3): 311–325. Young, R.E. & Vecchione, M. (1996) Analysis of morphology to determine primary sister-taxon relationships within coleoid cephalopods. American Malacological Bulletin 12(1/2): 91–112. Because the author lives approximately 10,000 years before the evolution of either Inklings or Octolings, he was unable to access any for study. However, he was able to access relevant game models and amiibos in private collections for the collection of morphological data. He also adopted a Sanei Inkling boy plush during the preparation of this manuscript. Props to Nintendo for making this awesome franchise in the first place, and to an anonymous friend/reviewer for trying to dissuade me from doing this silly project. Henry Thomas is a biology student at the University of California, Berkeley. He mostly studies pterosaurs, but also dabbles in the phylogeny of other creatures, regardless of whether they exist or not.